We recently changed the domain of this site from forza1south.com to forza1volleyball.com. Please reset your cookies if you have trouble finding it. Ready to play beach? Its fun and challenging! Beach (in the sand) is the same game but played very differently. The environmental factors and number of players alone challenges players to adapt and adjust their game to find success. On the sand, players get more frequent touches and have to become capable in all their skills to be effective. Trainings begin the week of April 22, 2019 and go through August. We have different programs for different age groups through the spring and summer to get you started! For beginning to advanced players. See you on the beach! Check this section weekly on Mondays for weekend highlights and upcoming events! Anaheim JNQ: 18UA Dana wins an Open Bid for Girls Junior Nationals at the SCVA JNQ this weekend! Good luck to all UA and National teams as they prepare for the Red Rock Wave JNQ in Las Vegas the first two weeks of April. 16UA and 17UA leave for Philadelphia for the NEQ JNQ April 19-21st and 15UA heads to Reno, to compete for a bid to USAV Nationals! Colorado Crossroads: 15UA finishes up top 8 GOLD at the Colorado Crossroads beating some of the top teams in the country and gaining national recognition as a top 15's team in the country. Forza1 15+ teams competed in top teams in the country in Las Vegas. Here are some highlights! 15UA took 7th place in Open Division- excellent show stopping wins over Coast, Club V and Texas Performance. 7-3 record. 16 National takes 5th place in American after starting in 50th! 8-1 record! They were undefeated until the last match of the weekend. 15 National went 8-2 on the weekend ending up in 21st place out of 193 teams! 12UA competed against top teams in the country and had great wins agains Wave, Arizona Storm, Offshore and Coast! 13UA Played in the Open division and proved they are ready for the next level wiht their smart offensive plays and nasty serves! 13 National finished 21st out of 72 teams and bonded as a team on and off the court. 14 National finished 46 out of 145 teams playing their best volleyball of the season! Local 12 Red is in first place in Open! HS Local Gold went 3-0 this past weekend! 12 Gold is in 4th place in club division! Forza1 HS Local Red is ranked 4th place at Volleyfest! Upcoming Tournaments-Good luck to all! Good luck to Forza1 UA and National teams on their trip to Las Vegas to compete in the Red Rock Wave JNQ! RECYCLE! Reminder to bring re-usable water bottles to Forza1. We are eliminating plastic from the gym. Congratulations to Alison Chopin on being named 14u Player of the Month for March! Alison is a lion on the court, very reliable and a great teammate to all! Congratulations to Paige Johnstone on Player of the Month for February! Paige's high level play as a libero lead this team to #1 in SCVA for 18's and 1st place at the 34th annual Las Vegas Classic! - This program is a 3 month commitment, or through April if joined late. - Payments can be made on a monthly basis, $120/month. Thank you to the 27 college athletes and many Forza families who attended our 3rd Annual Alumni Match! Video highlights coming soon! Congratulations to Juliette Russell on her commitment to play at Gonzaga University in Spokane, Washington. Congrats to Forza1 18UA Steven Koja on his commitment to play college ball at Vassar College! Congrats to Forza1 18UA Nicolas Pallotta on his commitment to play ball at UC Santa Cruz! Congratulations Reka Monteleone! 2020 pin on her commitment to play college ball at University of Nevada, Reno! Congratulations to Allison Sellway 2019 pin on her commitment to play volleyball at Reinhardt University in Georgia! Congratulations to Hailey Hinkel 2020 Outside hitter on 17UA on her commitment to play college ball at Siena College! Congratulations to Claire Little 2023 outside hitter on 15UA on her commitment to play college volleyball at BYU! See them all and pick what's right for you on our Programs Page! Classes - the perfect place to start if you are new and want a 1x per week commitment. Age-specific! Classes page here. Club Teams - We have three different Tryout periods. Boys Tryouts are September 7-9, Girls 14U Tryouts are October 6-8 and Girls 15+ (high school ages) Tryouts were in August (contact us if you want to play by phone). Click here for more info on Boys. Click here for more info on girls. Volleyball School - Professional level coaches right here in Temecula. Take your current skills to the next level. These classes are designed to be like mini-group private lessons where you get high reps and excellent fundamental training. School page here. Middle & Elementary School Leagues: Click here. Fall Fundamentals - 14 and under out of season training this fall! Now going and runs through October. Terrific training and growth opportunity! Registration is open. Click here for details. Open Gym - play play play, all are welcome! Sundays 6-9pm, $5/person. Private Lessons - train with excellent Forza1 Coaches and build your technical skills! Adult League - Fall League begins in September. Friday night fun for you and friends. Click HERE for details. Featuring Boys 18 National ranked 23 out of 114 teams! This team continued to grow with 4 of its players having 1 or less years of club volleyball experience. Bradley Handy (6'11") and Kyron Earl's (6'8") have provided great size. Setter, Steven Koja, continues to lead the team with his fast paced offense. Left side hitters, Troy Hess and Jack LeDuff are both great go to hitters. Both have explosive jumps and fast arm swings. Lefty opposite, Ian Little gives the team a lot of range as he is terminating well and is a serious threat on the right. Tomas Koja is a really special libero. He does a great job on defense but he also runs a great transition offense. 16 Elite Black had huge improvements this season including a 5-0 SCVA tournament. 16 Elite Red Team chemistry, energy, drive and Forza-like defense proving this team to be WINNERS! 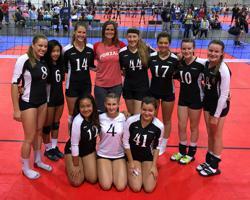 14 Elite Red 25th in SCVA! Good luck to all who are participating in the Boys Invitational in Anaheim this weekend and to 14's as they continue to rally and compete! Volleyball School classes NOW posted! Forza1 will help student-athletes prepare for and create opportunities for themselves and their future. We will provide Forza1 families with guidance, tools and resources to find the right collegiate fit academically and athletically. Forza1 staff will also communicate with college coaches that are looking for prospective student-athletes. Please visit our RECRUITING page for more information. 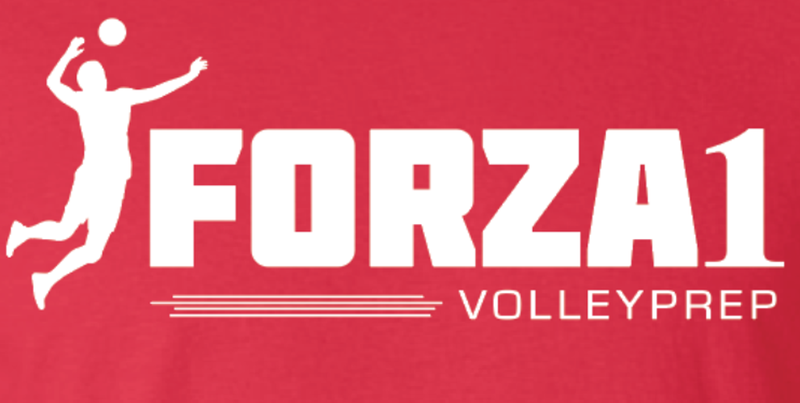 Welcome and thank you for visiting Forza1Volleyball.com! At FORZA1, we provide athletes of ALL ages and levels (girls, boys, adults and seniors) with the opportunity to play volleyball. We compete at the highest level nationally, as well as provide quality & affordable local training programs and classes for all. Please give us a call at 951-813-9315 if you have any questions. We are located at 27711 Diaz road in Temecula. Please come by for a tour of the facility. We are open 4-9pm weekdays. Interested in coaching volleyball or coaching club? Forza1 is always looking for qualified coaches who want to be apart of our organization. We are looking for coaches who are great teachers and learners and are motivated to bring the best out of our athletes. If you are interested in coaching now or during our 2018-2019 season please contact Dana. We have a lot of different opportunities with the various programs that we run year around. We will be hosting coaches trainings this summer and fall to develop coaches as well so inquire if you want to get involved! Thanks! Forza1 17UA and 18UA Forza1 Tour Italia 2018! 75 Forza family members left for a European Adventure over Spring Break. They played in the International Volleyball- ITorri tournament and took 4th place! They traveled through the beautiful country of Italia hitting Rome, Venice, Florence and more. Check out Forza1 Volleyball Facebook and Instagram posts for some fun pictures from Italy! Check us out on Facebook and other fun Social Media outlets!! Facebook is a great place to see our players and teams in action with lots of fun postings! Our Facebook page title is Forza1 Volleyball. Click HERE to check it out and don't forget to "like it" so you can be informed about upcoming events and training opportutnies! READY FOR AN AWESOME 2018! Want to be apart of Forza1 Volleyball? We are always welcoming new members to our club - coaches, families and players! Click above to find out details on our VolleyPrep League for ages 9-14 years old!